Mod The Sims - How to build (and edit) a highrise! Late Night - How to build (and edit) a highrise! Locked by: Don Babilon Reason: Say No! to thread necromancy. Replies: 129 (Who? ), Viewed: 198214 times. I found the highrise shells in BuyDebug, but was not able to place one on a residential-zoned lot (I get the message "cannot add, change or remove objects outside of your unit"). I'm guessing there must be a cheat, and probably the same cheat lets you modify the in-game highrises. Anybody figured this out yet? editing of any lot with a public room marker on it. contains one of these has the same Build/Buy restrictions as public rooms. Edit 2: First result, "rbbb off" didn't work for me, but "RestrictBuildBuyInBuildings Off" did, and allowed me to delete exterior windows that I hadn't been able to delete before. THis would be they way to modify existing apartments that your sims are living in. Last edited by Srikandi : 27th Oct 2010 at 6:56 AM. There is one apartment that you can see the different floors. It is a small brown one with a pool. Empty when you start the game. You could try the cheats on it. I don't have my game on right now so I can't tell you the address or name. sorry. Last edited by Srikandi : 27th Oct 2010 at 8:59 AM. This is very useful, Srikandi. Thanks for testing and sharing. Edit 3: I was able to remove and add the hidden room marker (taking em out is a good way to expand your apartment if there's extra room on the same floor). Srikandi, is it possible to build buildings without shells? And, after you move a family in, the other units are occupied by npc neighbors or if you want to move another family to another apartment (in the same building, that is) you can? Is anybody else unable to find a few of the building shells? I've only managed to find 4, and I've checked community objects AND buydebug. I have tried the RBBIB cheat, and It is working fine, except for a few buy items, like hottubs. The game continues to tell me that I can't place a hottub because of homeowner reasons. I've tried moveobjects on as well, to no avail. I am editing the glass wall? (I'm not sure of the exact name) penthouse. I really want to put in a hot tub because in the trailer of LN, it showed the couple on the penthouse roof overlooking the city. Does anyone by any chance know what penthouse that was? or was it just a random thing TS3 people made? I moved to a new apartment and I was able to take over a small room next to my apartment, yay! With ref the hot tubs, I was able to place a hot tub in my new appt but only because it's a 2-storey appt (called something like Veranda heights, near to the film studios). It's because the hot tub takes up space below the floor like SriKandi mentioned. If you don't own two stories you can't place a hot tub. On that note you can't actually own the floor below your appartment because it doesn't exist (see pic below). For anyone still trying to find the skip level markers, I managed to make a few more floors accessible by deleting all the floor tiles from the top floor and grabbing the marker underneath. After that, you can replace the floor tiles and move between levels. I built an apartment on a few floors this way, but I haven't had a chance to test it yet. I have no idea how you expand upwards, though. Ahh, brilliant idea, thanks That would be the solution to the hot tub problem mentioned above... dig by removing floor tiles, and delete the skip level marker. ...but you'll need to have hacks, cheats, a guide, and many hours of patience before you can make them yourselves. Yes I agree, where are the trash chutes and call box - essential items for creating an apartment? Perhaps EA doesn't want it to be too easy for the CC community to show them up creating new apartments? Hmm, I make it that that there are 7 new building shells (not including career ones), of which only 2 are available in buydebug. The rest don't appear to be in any menu whatsoever, much like the Ambitions fire fighters jacket. This is most frustrating. How is one supposed to get ones build on when the tools are not even in the hidden menus? Has anyone tried to make an entire floor the apartment? I have been able to expand an apartment, I see no reason why it couldn't be the entire top floor... the issue lays in the start to finish creation. I tried using CAW to create an apartment and was limited by only being able to go up 4 or whatever stories it is and then that the shell did not share and export with the building. I have managed to build from scratch inside the two shells in buydebug, and they appear to offer only 2 and 3 floors respectively. The green roof building has 3 floors. The floors are always at the same height as the Bridgeport equivalent of it. Your ground floor will always be a double height ceiling which doesn't allow for splitting in two. I wasn't able to expand on the floors any further than that, but I could pretty much emulate what EA did on the inside with careful wall placement. The black spaces are all yours this way. The ground floor can't really be used as apartment space due its odd double ceiling. Its a poor system, with 0 room for maneuverability. Once a new apartment shell has been placed, it cant be moved or deleted. Awesomemod allowed me to nuke it however. And what on earth is this about 'homeowners association does not allow this' when I am trying to build a second floor, on a building that I have had for months, in a completely seperate hood. Last edited by tizerist : 28th Oct 2010 at 11:55 PM. Before you start, you'll want to enter the cheats for "testingcheatsenabled true", "buydebug", and "rbbb off". This will allow you to purchase the markers that allow apartment functionality, and allow you to edit the portions of a lot that are considered public space within an apartment. 1. Public Room Marker - This marker should be placed in any room that you want any Sim who is visiting the lot to be able to walk around in, consider it as public space within a building such as the lobby. Unless cheats are entered, when you enter build / buy mode on a lot, any room that has a Public Room Marker can't be edited. The Public Room Marker is also the object that flags a lot as an apartment lot. Once one of these has been placed, any outdoor areas on the lot will automatically be flagged as public space. One special note: If you place a parking space in an area that is flagged as public space, your Sim can still purchase a vehicle and park it in that spot. 2. Hidden Room Marker - This marker is similar to the tomb room marker from World Adventures as some people have noted. It will turn a room completely black and hide the contents from the player. There is no way to unhide a room once this marker is placed inside it. You should place this marker inside the rooms that other Sims who will populate your building live inside, thus hiding it from view as your Sim can't visit their living area. If you hold CTRL + SHIFT and click on the hidden room marker, you can also set ambient sound for the building. You should only set this on one hidden room marker per lot, and it should be the marker closest to the player's apartment. Finally, any door that is connected to a room with a hidden room marker inside it should be flagged as an NPC door if you want another Sim to live inside it as if it was their apartment. Hold CTRL + SHIFT and click on the door, and select the "Make NPC Door" option. 3. Level Skip Marker - This marker isn't essential, but it can come in handy. 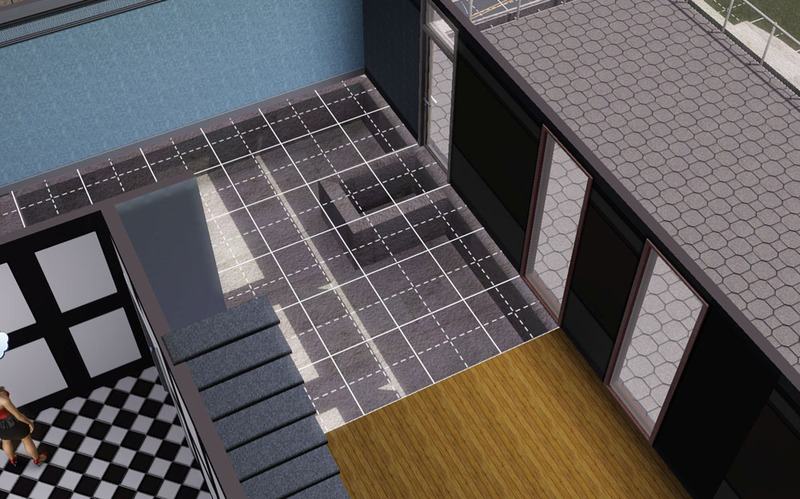 For example, if you build a four story building, and your Sim's living area is on the top floor, you may want to add a level skip marker on the second and third floor if your Sim has no reason to ever visit those floors. When this marker is placed on a floor, moving the camera up or down a floor will automatically skip past a floor that this marker is placed on. For your Sim's private living space, aka any room that makes up their actual apartment, don't place any markers in those rooms at all. Any room without a marker will be considered as a room that the Sim living on that lot owns, and they will be able to freely edit it in build / buy mode without cheats. Additionally, areas without a marker are the only areas that count towards the lot value or environment score. On a final note, every building that you want to have function as an apartment should have the Callbox object placed in an area that is considered public space. This will allow other Sims to visit and to call the NPC Sims that live in your new building! This was off the top of my head, so if you have any additional questions about how it works, I'll do my best to help or answer questions. Happy building! Forgive me if my question has an obvious answer as I haven't played Late Night yet (and won't until I get a better computer). But is it possible to create our own apartment building? As in modifying the external parts? Or what about making a row of houses together? Is that possible? This message has been deleted by ghsus.